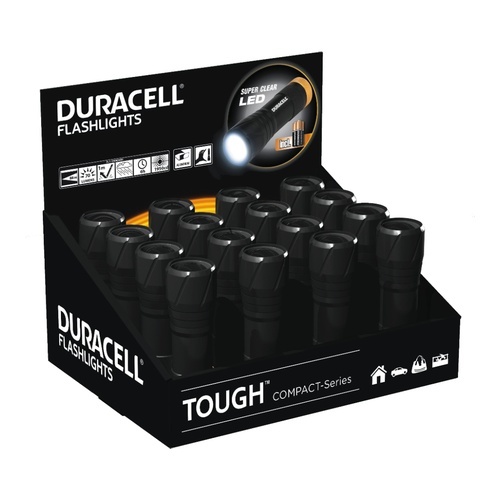 Built to survive any job, all Duracell® TOUGH™ flashlights are made with light, shock-proof and splash water protected aluminum of premium quality. There are five different series to meet all requirements - they vary in shape, size and technical details. The compact solution in a robust body. The COMPACT range is small, handy and made of splash water protected aluminum. They fit perfectly into handbags, satchels or glove boxes. The COMPACT flashlights have an extremely long runtime - a helpful feature in various situations such as: flat tire, power blackout or even on the way to school in winter.